Instead of planning their own lives, central planners plan every other person's life. They are meddlers. Unaccomplished at any other various skills, as we have seen with Barack Obama, they thrive on parasitic behaviors and controls that inflate their egos. It is what they live to do. They can't leave well enough alone because leaving well enough alone would give them nothing to do. They don't know how to do anything else well enough to survive. Think about that. If you put Barack Obama on the street to fend for himself, what would he do? He'd hustle. He'd scam. He'd sell himself as a visionary. I doubt seriously if he could ever do anything as menial as flipping a burger or washing a dish. His ego would not let him, for one thing. He'd last about 5 minutes before throwing a fit about how beneath him those jobs might be. Today it struck me that is at the heart of all of the chaos brought by Progressives in government. Someone has misled these people to think they are brilliant, when in fact they are lacking in basic intelligence. The tragedy is that the world is covered up with these manipulators. All of their existence is based on theories of anti-reality, such as Rousseau, Hegel, Marx, et al. 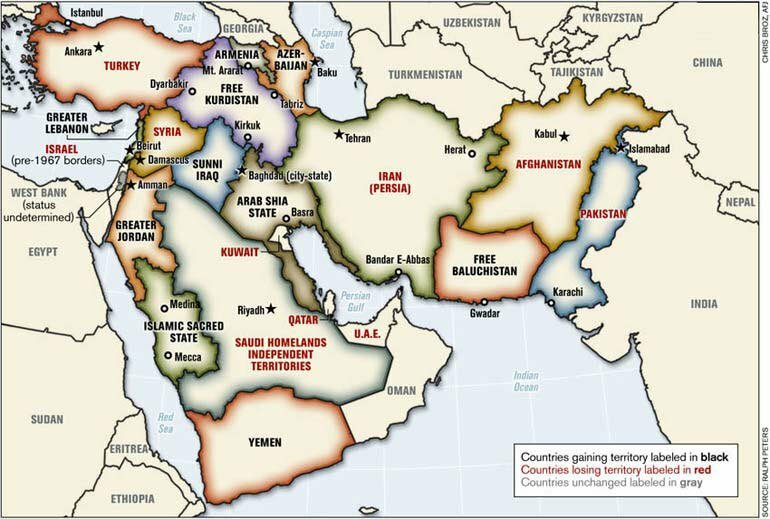 And now we witness the "New Middle East" brought to us by global planners who are using the American people for their end goals of destabilizing the Middle East for an end game I can only guess has something to do with controlling the area for its resources. The "New Middle East" is a theory developed by some globalist think tanks made of people such as I just described. These are the same people bringing us the "New World Order." And... no tin foil hat is needed to see this manifesting right in front of our eyes. The Council on Foreign Relations has been pushing for this "New Middle East" since Jimmy Carter had the White House...and we all know how well that turned out. "This has been falsely portrayed to the Western public as a political revolution crushed in blood by a ruthless dictatorship. Of course, this lie has not been universally accepted. Russia, China and the Latin American and Caribbean member states of ALBA repudiate it. They each have a historical background that allows them to readily grasp what is at stake. The Russians are thinking of Chechnya, the Chinese of Xinjiang, and the Latin Americans of Cuba and Nicaragua. In all these cases, beyond ideological or religious appearances, the methods of destabilization by the CIA were the same." My next question is this: Are we now going to fight a proxy war with Russia over Syria? Are we already doing so? It is so painfully obvious that the CIA, with direction and aid from the State Department, has been fomenting this Arab Spring for quite some time already....and without real knowledge of American citizens. How many more good Americans will die to continue this plan for global re-alignment? I do assume several in Congress have known this all along. I also assume Americans have been kept in the dark on the ruse of "security." The spin from media is breathtaking, so outrageous and false. The pitiful joke from the Obama administration about some ridiculous film being responsible for American embassies being attack is beyond laughable. The insult is that Americans are that stupid. Let's face it. The game plan is to erase national sovereignty in the Middle East and create a "region" under rule. And if you think that is such a great idea, ask yourself whose national sovereignty is next. If we can accommodate globalists' interventions all over the world just to sate some globalist agenda, do you honestly think that ends with our nation intact? If you think that, you haven't been watching millions of illegals pouring into the U.S. with no Federal protection. There is a plan afoot. We just don't know what it is or where it is taking us. What we do know is that it has everything to do with global regionalism and a disappearing United States of America. And what we do know is that our government no longer works for us but for some invisible hands who have made a plan for us. Is this New Middle East a plan Americans believe in? Is this a plan of common dreams of the American people? (Hardly. Most Americans are not even slightly aware of this plan, although surely Americans have to be asking themselves why we are shedding blood for Islam and nations who hate us.) Granting there are resources in that area, is this plan a manifestation of Neo-Colonialism? And is that something Americans are willing to place their sons and daughters lives at risk to support? No going back now. They broke it....we own it. The map the Pentagon wants to see in the Middle East would leave Syria without access to the oil-rich Mediterranean Sea, and with the goal of redirecting oil flows to China and Europe, researcher William F. Engdahl told RT. ­Engdahl says the Arab Spring in general is a well-planned, long-term project aimed at regime change in the Islamic world. And looking at the aftermath of the Arab Spring revolutions, it is anarchy instead of democracy that was successfully achieved.